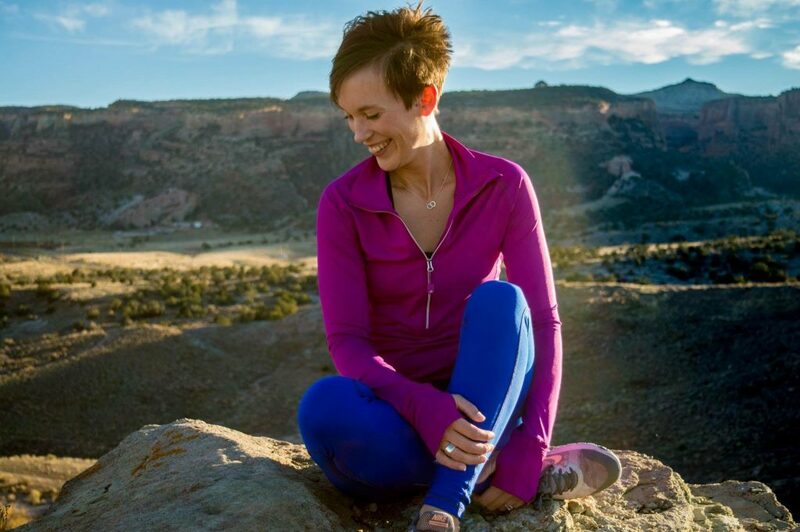 It’s the New Year, and everyone is wanting to make changes toward leading a healthy lifestyle. For some reason, these new year resolutions are always an individual goal…”I want to lose weight”, “I want to eat healthier” rather than a whole family affair. Studies show that when a person is held accountable by either a friend, family member or group of some kind, goals are far more likely to be achieved. Let’s discuss how to make your family a BIG part of your fitness and healthy eating goals, so you’re more likely to succeed and make them not only new year resolutions but lifelong changes. 1. Specific. Your goal should be clear and easy to understand. A common goal, “get healthy,” is too general. There are so many ways to get healthy. How do you want to do it? Is it losing weight? Start exercising? Stop smoking? Break it down, and it will be easier to manage. 2. Measurable. A goal to “lose weight” is not enough. How will you track your progress and how you will know when you have reached your goal? Making your goal measurable means adding a number. 3. Attainable. Before you can add a number, you have to know how high or low you want to go. It’s good to set a big goal but make sure that it’s also realistic for you to achieve. Likewise, a goal that is too easy is also not very motivating. Know your limits and honor them. Let’s take our goal above. What percentage is attainable? Research suggests that a 5-10% weight loss is attainable for most overweight people. 4. Relevant. 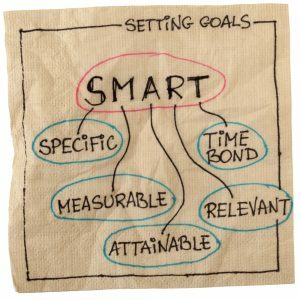 Set goals that are important to where you are in your life right now. Don’t set a goal that someone else is pressuring you to attain-that isn’t very motivating. 5. Time-bound. Include an end-point. Knowing that you have a deadline motivates you to get started. We will walk 5 days every week for 30 minutes each. We will drink water instead of soda every day this week. We will bring our lunch to work instead of eating out 4 days this week. Becoming healthier starts with being SMART! 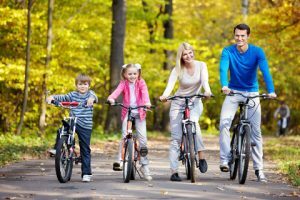 The American Academy of Pediatrics encourages regular physical activity for children aged 2 and up, on most, if not all, days of the week for an average of 60 minutes a day. Regular activity is considered most important for obtaining health-related benefits, even if it is not vigorous exercise. Youth are inherently fit; current recommendations focus on making sure children stay active instead of retreating into a sedentary pattern. Recommendations for youth fitness focus on promoting a variety of activities that are fun and can be easily incorporated into a child’s lifestyle. These activities can include team sports, individual sports, and recreational or lifetime activities, such as walking, bicycling, and swimming. Any form of physical activity that is regular, enjoyable, and sustainable is the desired endpoint. Exercise will be most enjoyable, and thus, beneficial if it is part of a family experience. Fitness should be a family affair and should be promoted as a fun, healthy way of life. In addition to regular physical activity, a healthy, balanced diet filled with fruits, vegetables, and whole grains will help your children maintain fitness levels and healthy body mechanics. From language skills to grades, research links conversations between adults and children during family meals to success at school. Frequent family meals are linked with being successful in school. Family meals expose children to a more diverse vocabulary and were linked in one study to language development and later academic success. A large body of research also supports the link between family meals and nutrition. A Harvard University study published in the Archives of Family Medicine found that families who ate together almost every day generally consumed more important nutrients like calcium, fiber, iron, vitamins B6 and B12, C and E, and less overall fat than families who rarely ate together. During adolescence, family meals also contribute to higher daily intakes of fruit, vegetables, calcium and other important nutrients, and lower intakes of soft drinks. 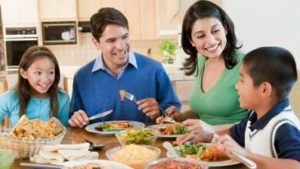 A research review published in the scientific journal of the American Academy of Pediatrics found that children and adolescents who eat three or more meals with their families per week are 24 percent more likely to eat healthy foods and 12 percent less likely to be overweight than peers who do not eat with their families as often. The benefits of family meals extend beyond nutrition and academic achievement. Mealtime conversation promotes positive self-esteem in children and brings the family together. Family meals also provide an opportunity for parents to engage children in the planning, preparation, and enjoyment of food, which creates a lasting and positive relationship with food. Armed with the understanding of why family meals are important, commit to putting food on the table and reaping these benefits. Two additional tips to eat together and eat better focus on role modeling and meal ideas. When you cook and serve meals at home, you have more control over the quality and quantity of your family’s food choices. Kids tend to mimic their parents’ attitudes about food. Children won’t perceive healthy eating as important if they don’t see you doing it. Eat and serve sensible portion sizes. Be open to trying new foods and new ways of cooking foods. Learn more about role modeling to have your actions teach children about healthy eating. Family meals should be dynamic – an exchange of ideas, conversation, and feelings. Turn off the television, the video games, mobile phones, and the computer. Mealtime is a wonderful opportunity to strengthen family ties and pass on family cultural traditions. Encourage your kids to help prepare meals, set the table and help with dishes. You can keep meals simple, yet still nutritious and interesting, by sticking to nutrition basics. Offer your kids a variety of great-tasting foods from the major food groups for any meal or snack. Learn how to plan meals for your family in advance can save time. When time is of the essence, keep meals simple. It’s easy to purchase a ready-made sauce or marinade and add it to sautéed chicken, beef or shrimp for a tasty main course. Cook on weekends and double a favorite recipe, enjoying one meal now and freezing the other to enjoy some evening when you’re too tired to cook. Soups and casseroles are especially good to freeze. Take advantage of prepared foods. Purchase a freshly roasted chicken from the supermarket and round out the meal with some brown rice and a green salad, and fresh fruit or yogurt for dessert. No matter how simple the meal, take the time to sit down and enjoy it with your family. Make mealtime a pleasant experience, not a time for discipline or arguing about problems at school or work. Time spent breaking bread with friends and family will help your children form positive attitudes about food and eating and create fond family memories that will last a lifetime. Health and fitness don’t have to be an individual endeavor. In fact, they can be a fun space for a family or couple to bond and become closer together! Start involving your family in your goals for wellness and you will be amazed at the benefits!